No matter how advanced we Kashmiri may be, but at the end of the day –we ‘the Kashmiris’. We may have the latest gadgets, we may be up to date with the technological trends. Should also mention we may continue to depend more on internet and electricity and so many other things attached with these two. Come winters, when the cold sets in, cloudy days and longer nights, orange chinar leaves. Not to be missed out our contribution to the pollution ‘burning chinar leaves’, but can that be helped – after all winter has set in. Hello! And the sub-zero temperature, road blocks (national highway) our so assumed life line. And the irritating flight schedules – more cancelled flights than flights ! 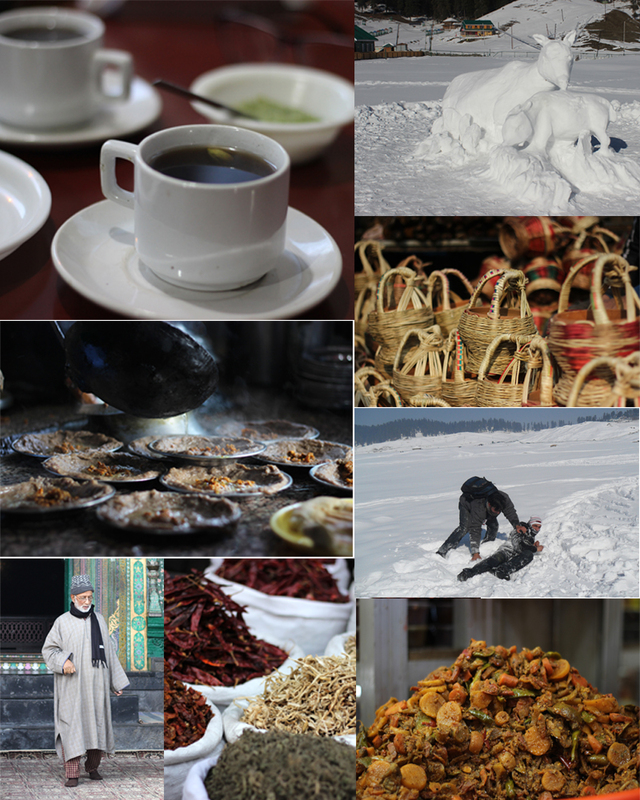 Despite all the funds aviliable and the projects we hear about, for ages, endless & unscheduled power cuts contine to twirl Kashmir into grey and dull winter times- this aspect seems have become part of our Kashmiri culture! But than we have few things which supersedes every thing…. Kanger – ‘What Laila was on Majnun’s bosom, so is the kanger to a Kashmiri’. 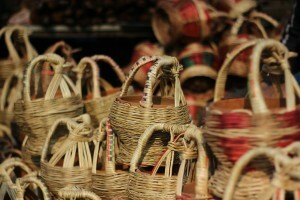 Kangri, a earthenware filled with embers and sheathed in pretty handmade wicker baskets and is carried as a personal warmer. Kangri, a fire-pot, keeps people warm during the severe winter months when temperature dips to as low as minus 4 degree. It is a portable and moving heater that Kashmiris keep in their pheran. At times it is over utilized, when it become a part of an argument. 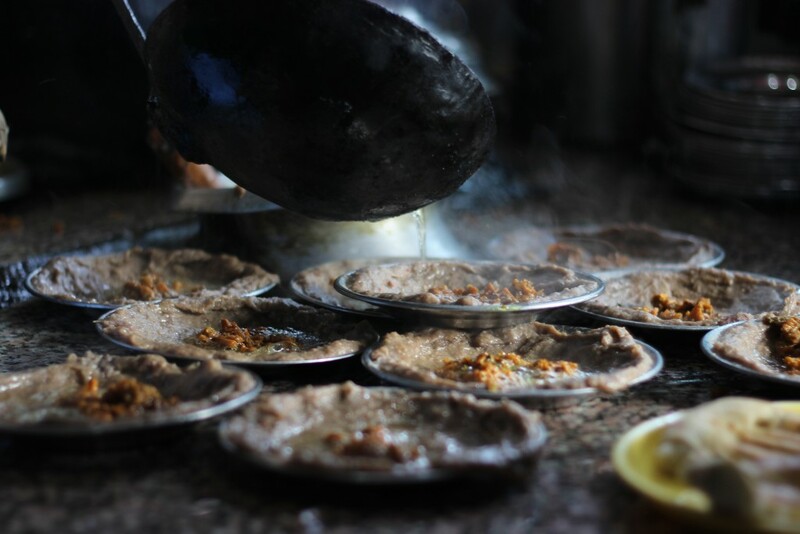 Harise – As the temperature falls in the valley, harissa is consumed as the perfect and ideal breakfast. One bowl is supposed to give enough calories to keep one going for a whole day & keep the person warm – this is what every one says. Don’t mind one more helping. Prepared with amalgamation of meat, wheat grains, rice and ghee or butter, it is served especially hot with Kashmiri local bread. Mind you lots of calories. Pheran – The Pheran (Cloak) is the prominent outfit of Kashmiris. It’s a long gown made of wool or tweet. The Pheran worn by women is usually designed with Zari, embroidery on the hem line, around pockets and more often on the collar area. Also, an inside layer of lining is used underneath the Pheran called ‘poech’. At places it is take part of ‘ fashion statement’ process. Hamam – Hamam is a room with a hollow base for burning firewood, which provides heat. To construct a Hamam specially carved stones are used. Hamam is a healthy alternative to gas heaters, coal heaters and electric heaters. Hello, it also ensures a supply of hot water through an attached copper tank (called ‘Khazane’ in Kashmiri). It can be used to dry clothes too, since wet clothes just freeze in the open. Hokh seun – As connectivity with the outside world often get snapped because of heavy snowfall. 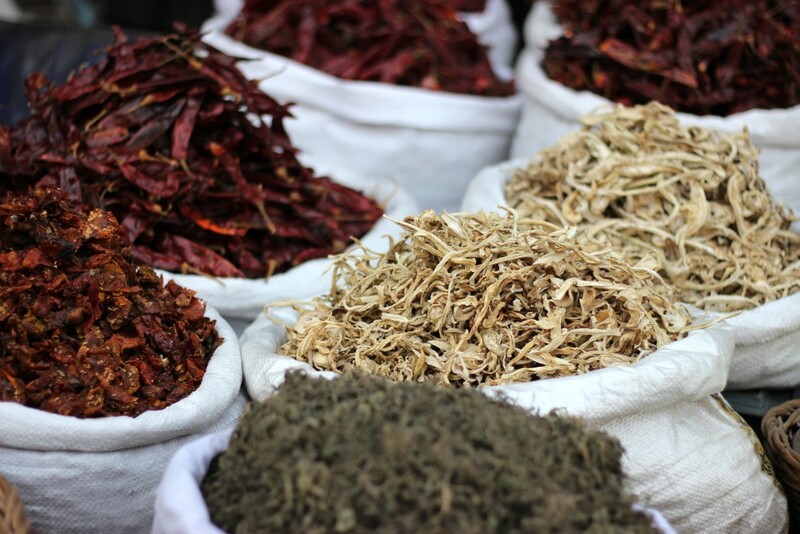 Sun-dried vegetables such as tomatoes, turnip, brinjals, green beans and red chillies which were dried in open sun in most of the Kashmiri homes during summers – preparation for the harsh winter days comes very handy. Fear of highway blockade due to the weather has got nothing to do with this. 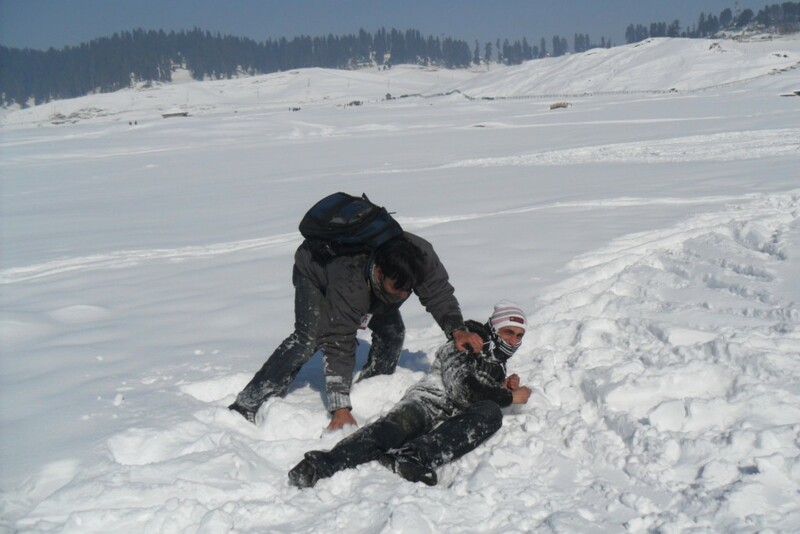 Sheen-e-mohnue – After the first heavy snowfall through out Kashmir valley, no doubt how cold it is people love to come out from their homes especially young boys and girls and make a snowman. 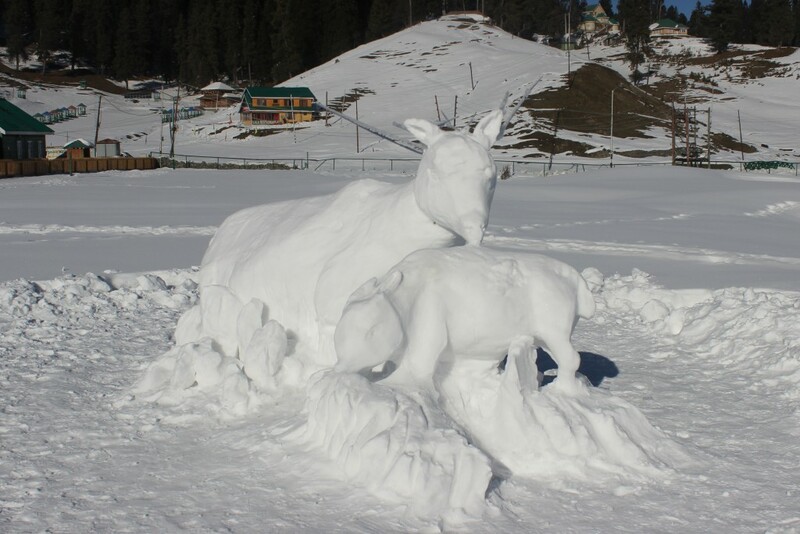 Some of them draped in proper traditional dresses like pheran in order to give them attractive look and freezing temperature ensures that snowman stays on the ground. Now one finds them draped in branded clothes also, of the discarded clothes, which refuse to fit in on anybody! Sheen Jung – When there’s more than enough snow to make a snowballs and you are in a mood to enjoy snowball fighting, what better than making small round balls of snow and throwing them around, including at friends. Anchar – Kashmiris cannot do without traditional pickle especially in winter. 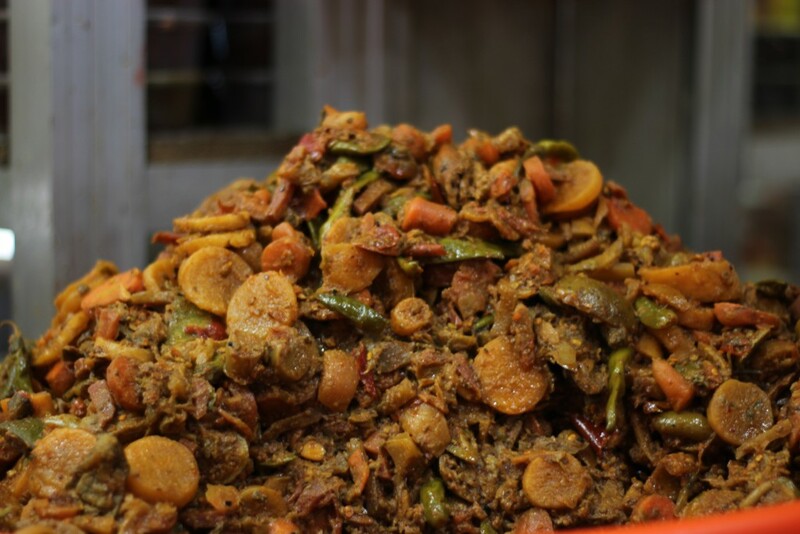 Prepared by using green leafy vegetable locally called Haak, turnip, Carrot, Lotus stem and Cauliflower mixed with proper Kashmiri spices and stored in an earthen pot for about 5-6 weeks. Trust me still adds flavor to the meal & to our lives. 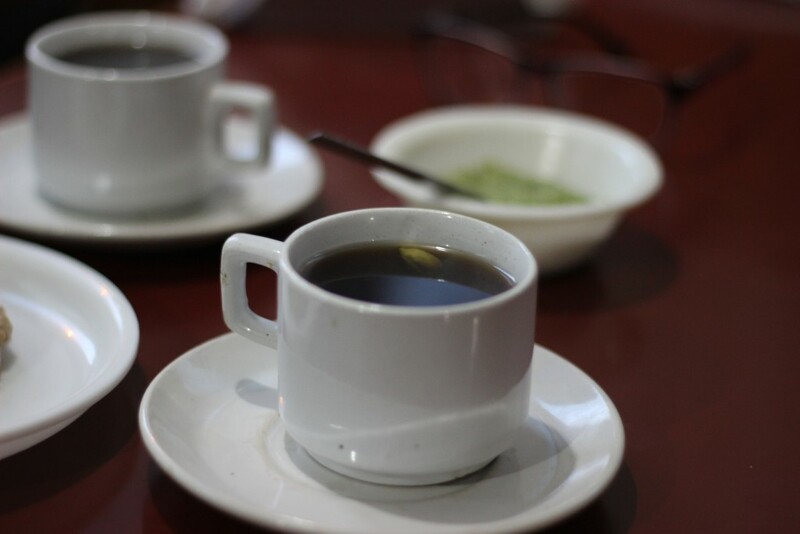 Shangri kahwe – Those who have not had a cup of Kashmiri Kehwa are missing on a drink. As a Kashmiri, we know it well. But have you heard about Shangri kahwe? It is prepared from some significant spices like liquorice, clove, cinnamon, and cardamom; that have health benefits and is an age old home remedy for respiratory and various other cold related problems, it’s widely used and thought to be best treatment of cold related diseases in winter in the entire valley of Kashmir. People you need a drink. Candle light dinner – Not expensive at all. Thanks to the power management. The official statement is heavy snow laden electric wires, etc., But the fact is that Kashmir faces acute shortage of electricity during winters and electricity is gone for almost days together. So, candle light dinners light the Dastarkhaan is a regular feature. Be jealous. We Kashmiris have candle light dinners almost every night. Read that with a smile on my face and nodding along. Brilliant! 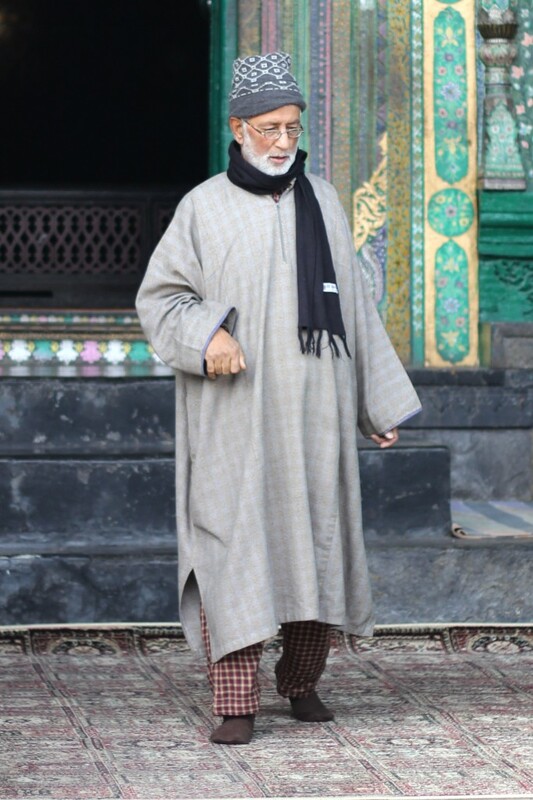 Interesting…more interesting is the pheran article as the person in the picture is my father. Loved the last one, candle light dinner. Keep it up. I came to know various things from your write up. The mouth watering achaar is really nice. One message is coming out from your write up that is If you want to enjoy, you can enjoy in any situation. God bless.